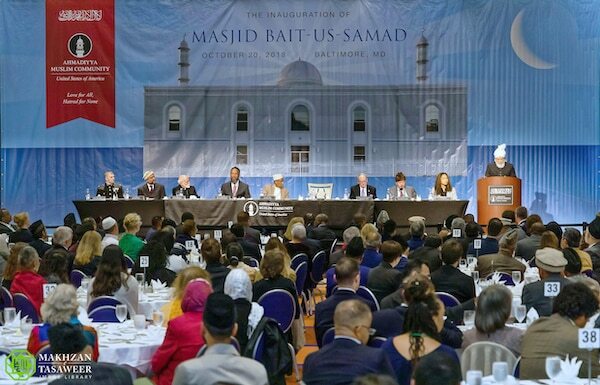 Keynote Address by Hazrat Mirza Masroor Ahmad, Worldwide Head of The Ahmadiyya Muslim Community, at reception to mark inauguration of the new Bait-us-Samad Mosque in Baltimore, USA. 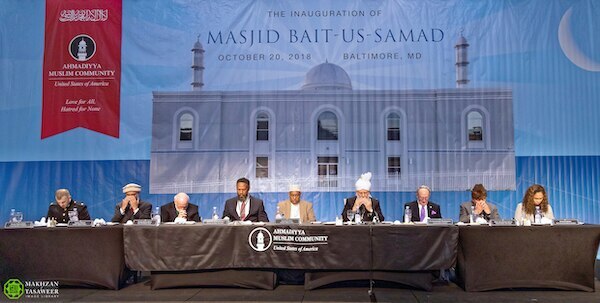 On 20th October 2018, the Worldwide Head of the Ahmadiyya Muslim Community, the Fifth Khalifah, His Holiness, Hazrat Mirza Masroor Ahmad (aba) inaugurated the Bait-us-Samad Mosque in Baltimore, USA before delivering the keynote address at a special reception held to mark its opening. 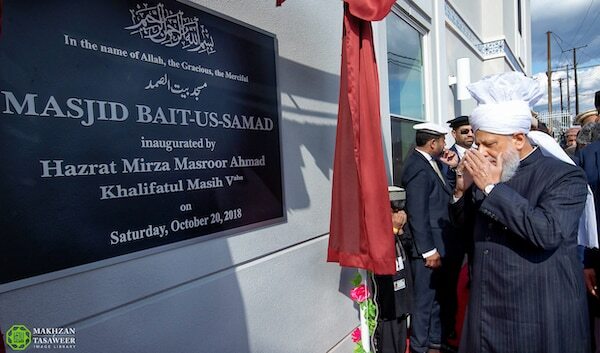 Upon arriving in Baltimore, His Holiness officially inaugurated the mosque by unveiling a commemorative plaque and offering a silent prayer in thanks to God Almighty. Thereafter, His Holiness led the Zuhr and Asr prayers at the mosque and inspected the new premises. In the evening 500 people attended a special reception held at the Hilton Hotel, Baltimore, including 320 dignitaries and guests. His Holiness met with a range of dignitaries privately, including Honourable Ben Cardin and Honourable Catherine Pugh, Mayor of Baltimore. His Holiness also answered questions during a press conference with the assembled media. A range of dignitaries also addressed the audience, including United States Senator Ben Cardin and Honourable John Wobensmith, Secretary of State of Maryland. 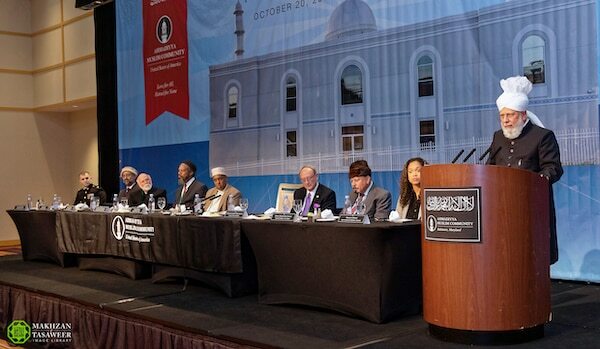 The National President of the Ahmadiyya Muslim Community USA, Dr Mirza Maghfoor Ahmad, introduced His Holiness prior to the keynote address. The official transcript of the keynote address delivered by His Holiness on this occasion is presented here. “Bismillahir Rahmanir Raheem – in the Name of Allah, the Gracious, Ever Merciful. First of all, I would like to take this opportunity to express my heartfelt gratitude and thanks to all of our guests who have taken the time to join us here today. Your attendance is noteworthy and commendable given that you are attending a religious community’s function, at a time when interest in religion is on the decline in much of the world. It is of even greater note that you are attending a Muslim event, where a new mosque is being inaugurated, despite the fact that most of you are non-Muslims and have no religious or emotional affiliation with mosques or with Islam. 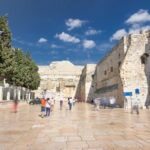 Indeed, we are all well aware that, regrettably, we live in a time where many people hold reservations, and even fears, about Islam and about Muslims. In light of all of this, undoubtedly your attendance is praiseworthy and obliges me to profess my deepest gratitude to all of you. 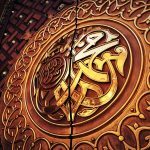 Moreover, I should clarify that my thanks is not offered as a mere courtesy, rather it is a religious duty placed on me by Islam, as the Prophet of Islam, the Holy Prophet Muhammad (sa), taught that a person who fails to express his appreciation to other people, cannot be grateful to God Almighty. Hence, I consider it my religious obligation to express my sincere gratitude to all of you. Moving on, I anticipate that you will have joined us today in the hope of learning more about Islam and to find out the reasons why we have built this mosque. Certainly, given the fact that many people have misgivings about Islam, due to what they have seen in the media, such curiosity and interest is natural. Indeed, due to the climate in which we are living, if you harbour any fears or concerns about this mosque, it is quite understandable. Undoubtedly, in much of the world, there is now an increasingly prevalent view that Muslims are to be feared. As a collective, Muslims have been branded as troublemakers who seek to divide society and desire to shatter the fabric of social cohesion and peace. Muslims are seen as people, who are neither able to live together in peace, and nor are they able to live peacefully with others. Further, the construction of a mosque is something that evokes even greater fear and anxiety amongst many non-Muslims. Many people fear that a mosque will provide Muslims with a centre to isolate themselves from the rest of society and to undermine the peace and well-being of the local town, city or even of the nation itself. I have personally seen that such fears do exist amongst many people in the non-Muslim world and regrettably such angst and suspicion of Islam and its followers continues to rise. Nevertheless, the truth is, and will always remain, that Islam is completely opposed to all forms of extremism, terrorism or violence. It condemns in the strongest possible terms any attempts to violate freedom of belief and freedom of conscience. Under no circumstances does Islam permit coercion or force in the matter of religion; rather, Islam teaches that religion is a matter of the heart, as is written in the Holy Quran. Thus, I firmly believe that the widespread and common perceptions of Islam amongst non-Muslims are actually misconceptions. 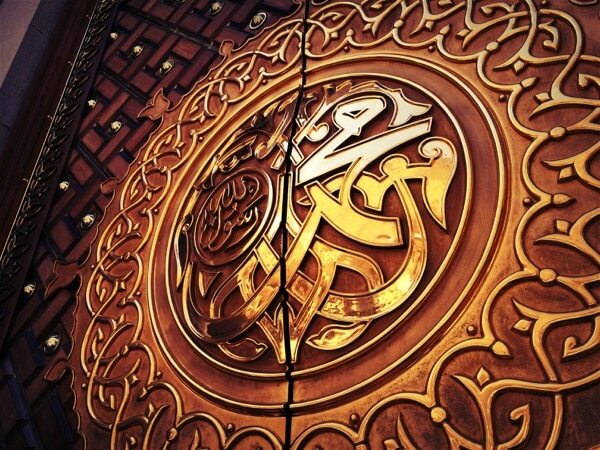 In terms of any mosque, it is vital to look at its true objectives, according to the teachings of Islam. What do Muslims – true Muslims I should say – intend when they build mosques? 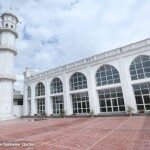 If a person judiciously assesses the objectives of a mosque and the reasons why they are considered to be sacred places to Muslims, they will soon realise that true mosques are not there to be feared. In order to alleviate any apprehensions that may exist amongst the local community, I shall now briefly mention the core purposes, so that you can all better understand what this new mosque and indeed all true mosques represent. A primary objective of a mosque is, of course, the worship of the One God and so mosques are a place where Muslims join together to bow down and prostrate before God Almighty in worship. Such worship is offered five times a day and is known as ‘Salat’. This is a fundamental pillar of faith for every Muslim, which he or she must observe. A second crucial purpose of a mosque is to be a place for Muslims who join together for worship, to be able to strengthen their mutual relations and to develop unity amongst the community members. Hence, through their mosques, Muslims are able to forge greater ties of kinship and to establish an atmosphere of brotherhood and mutual sympathy. In this verse, the Holy Quran instructs Muslims to show kindness and compassion to a whole range of people. It calls on them to serve their parents, family members, other relatives and also vulnerable members of society. It also places great emphasis on fulfilling the rights of one’s neighbours. 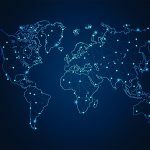 Neighbours are not just people who live in a person’s immediate vicinity; rather, the scope of neighbours in Islam is extremely far-reaching and includes those who live near, as well as those who live at a distance. It includes a person’s colleagues, his travel companions, and much more besides. Therefore, in essence, all of the people of this city are the neighbours of this mosque. Thus, instead of destroying the peace of society, true mosques are built to foster peace between the peoples of different communities and beliefs. In short, mosques are a place for Muslims to elevate their bond with their Creator, God Almighty and to fulfil the rights of their fellow human beings. Any mosques that do not fulfil these paramount objectives are worthless and merely hollow shells that serve no purpose. 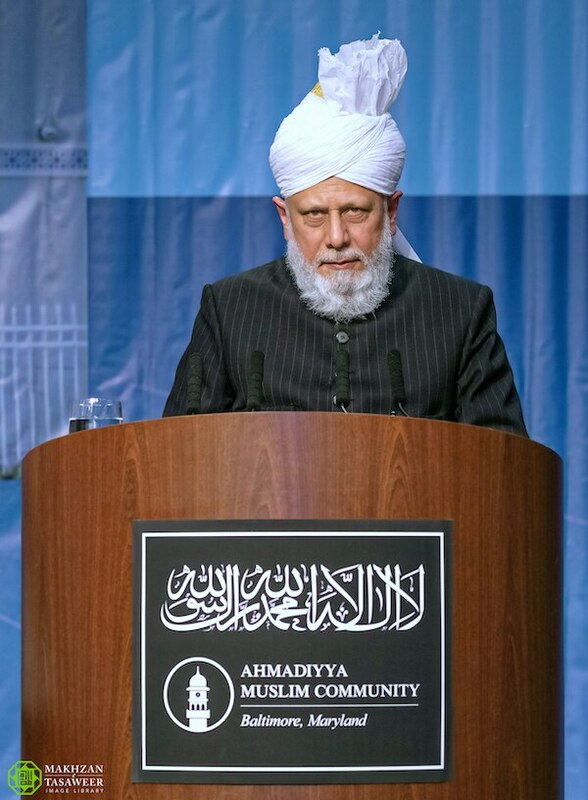 Since its foundation, the Ahmadiyya Muslim Community has built mosques across the world and our history testifies to the fact that, wherever we build mosques, we endeavour to fulfil the objectives that I have just outlined. Through our conduct and behaviour, we seek to practically manifest and live up to our community’s slogan of, ‘Love for All, Hatred for None’. We seek to build ties of friendship with non-Ahmadis and non-Muslims. We strive for inter-faith dialogue. We value and cherish our neighbours. We are ever ready to help those who are in need. We champion the rights of the weak and deprived. We are there to serve the community and to be loyal and faithful citizens. This is our faith and this is our teaching. This is why we build mosques. 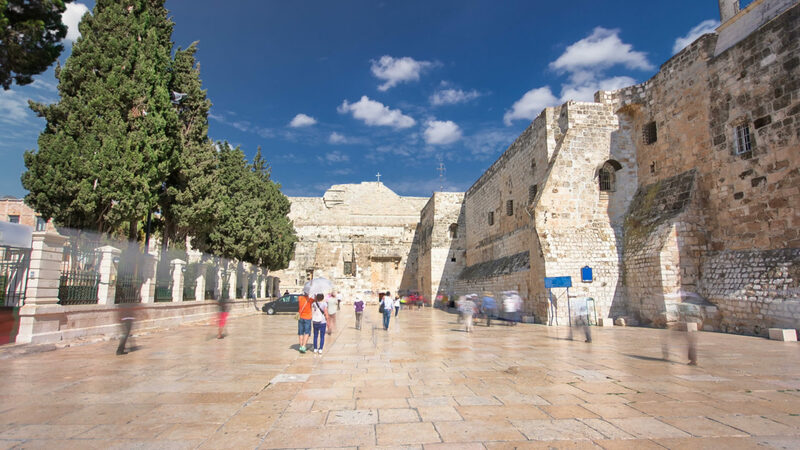 These verses categorically declare that the prayers of those people who worship God, but who fail to discharge the rights owed to His Creation, will be rejected. Their worship and entry into a mosque is nothing but an act and a superficial gesture. The Holy Quran is very clear that their prayers are meaningless and their hypocritical ways will lead only to their disgrace and despair. Consequently, the reality is that true Muslims, who worship Allah the Almighty with sincerity, can never do anything that harms, or negatively affects, the peace and well-being of a society. Nor can they seek to undermine or seize the rights of other people, because to do so would be to betray their faith and to abandon the teachings of the Holy Quran and of the Holy Prophet Muhammad (sa). Thus, let me once again reassure you about this mosque. You have no reason to be anxious or concerned. 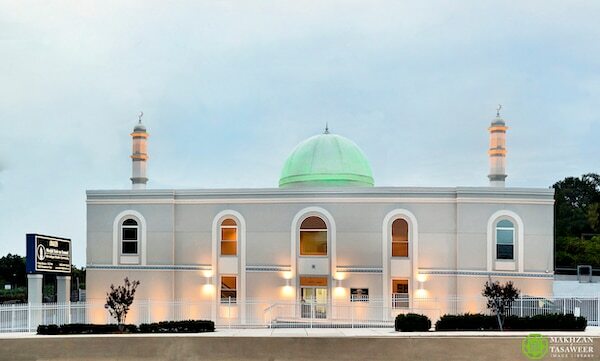 The doors to this mosque will be forever open to all peace-loving people. They will always be open to those who value humanity. I am entirely confident that, God Willing, this mosque will prove to be a symbol of peace, radiating nothing but love, compassion and brotherhood throughout the city and far beyond. It will serve as a beacon illuminating its surroundings and spreading light in every direction. It will be a House of Peace in which the worshippers join together to serve their neighbours and to fulfil their rights. 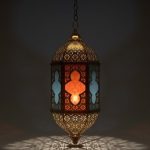 It will represent the enlightened teachings of Islam and dispel all fears and myths that exist about our religion. God Willing, any lingering fears that may remain in the hearts and minds of the local community will vanish altogether. When they see this mosque or meet the people who worship here, they will soon realise that there is no need for any apprehension or trepidation. Whilst it is easy to make such statements, I am convinced you will soon attest yourselves to the fact that Ahmadi Muslim practice what they preach and are people who not only proclaim Islam’s teachings of peace, but who uphold them. It is my firm belief that the local community will soon realise that what I have said about the objectives of mosques are not sugar-coated words masking a bitter pill, but represent the honest truth. At this time, I would also like to say that it is up all members of society, whether Muslim or non-Muslim, whether religious or non-religious, to work together for the peace and prosperity of the world. Rather than making allegations against one another, or pinpointing each other’s flaws and weaknesses, we should open our hearts to others and show grace and compassion. Instead of attacking each other’s religions and needlessly provoking one another, it is the urgent need of the time that we exhibit mutual respect and tolerance. True and long-lasting peace cannot suddenly develop with the click of our fingers, rather it requires us to focus upon those things that unite us and which bring us together, rather than letting our differences divide us and break our societies. 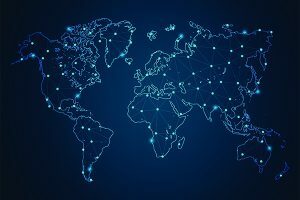 I truly believe that we are passing through a critical juncture in the history of the world where, both at a national and international level, the world is becoming increasingly polarised and divided. We stand upon the brink of disaster and so now is the time to take a step back and focus all of our energies on protecting the future of mankind. Now is the time to show our humanity and to spare no efforts in developing peace in our communities, in our nations and indeed throughout the world. 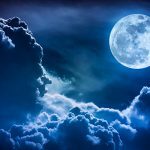 Only if we come together and respect each other’s beliefs, can we begin to heal the bitter rifts that have taken root in much of the world. Only then can we bequeath a legacy of hope for our children. Only then will we leave behind a prosperous and peaceful world for the coming generations. We must not be blinded by self-interest and greed, rather we must open our eyes and look to the common good. It is my sincere hope and prayer that all of us, no matter our religion or beliefs, can work together with a spirit of benevolence and mutual respect and that our shared ambition is to make the world a better place for those who follow us. Our common goal should be to foster peace, harmony and goodwill between the people of all communities and we should constantly aspire to and strive to leave behind a peaceful world for our children in which people are able to live side by side, irrespective of differences of race, religion or belief. At the end, I would like to thank you all once again for joining us. May Allah the Almighty bless all of you.